The ZGTS Derma Roller is a premium quality skincare tool with 192 titanium needles . Derma rolling reduces the appearance of wrinkles, scars, cellulite and stretch marks. The Derma rolling system is a skin care breakthrough that naturally creates new, healthier tissue to replace the imperfections of the older skin. The secret to eliminate imperfections is by rebuilding collagen beneath your skin. The Derma Roller compliments your skin care regime, and enhances the efficacy and absorption of your skin care or skin brightening products. ZGTS Derma Roller's sleek curved design is easy to hold and use. It�۪s handle is made of colored plastic, and the roller head holds 192 micro needles that are made of titanium alloy. These needles are really tough and durable, and are exceptionally well suited for needling large and small areas. 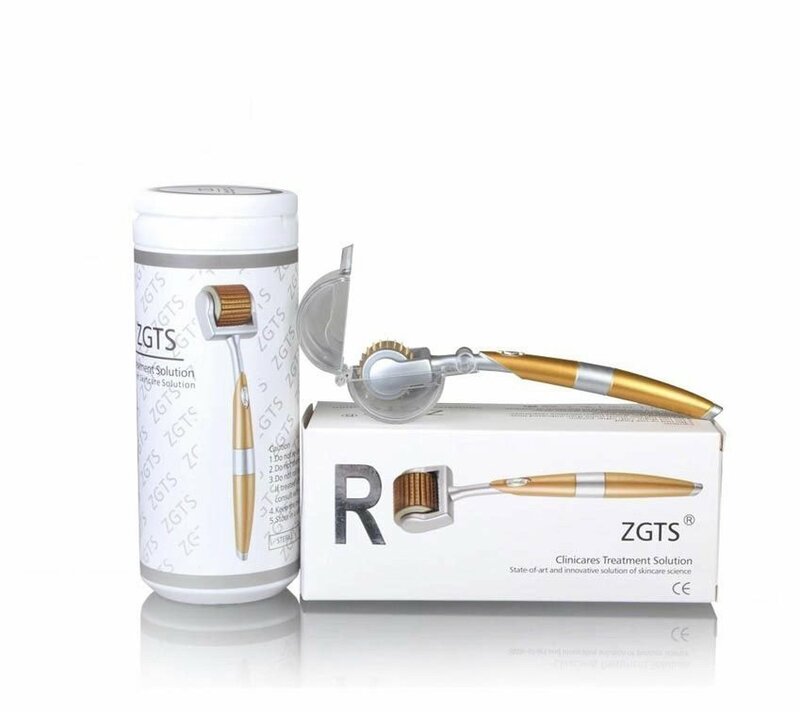 ZGTS dermaroller is ideal for stretch mark removal and scar reduction treatments on any part of the body ��� titanium needles will ensure many months of microneedling pleasure! Within the box, you will find the Derma Roller inside its own plastic carton, and a smaller plastic cap to cover the head of the roller. Please store your roller inside this case in between uses. Effective in stimulating collagen- boosts collagen and elastin fibre. As we age, our skin become loose and saggy due to collagen depletion. Dermaroller counteracts this by stimulating the production of collagen and elastin in a natural way. Enhances the absorption skin care products. Most effective when used with skin care products that contain hyalauronic acid. Effective in reducing wrinkles and and smoothes fine lines.The newly produced collagen act as fillers for facial lines and wrinkles. As a result of this increased skin elasticity, facial lines and wrinkles are permanently reduced. Helps to improve skin texture- many users have also reported improvement in skin texture. This can be attributed to the skin cell renewal and regeneration effects of the treatment. Derma rolling benefits aren�۪t just gained in the needling and resulting repair of the skin. Derma rolling is capable of exposing deeper layers of your skin to the benefits of various topical ointments, natural oils, treatments, and products, leading to greater effectiveness and therapeutic effect. In other words, after derma rolling, your skin will be more susceptible to the effects of anything that comes into contact with it, based on the increased exposure to the vital most layers of the skin. Therefore, any and all skin treatments or supplements (such as avocado oil, coconut oil, sunflower oil, or jojoba oil) could be enhanced in effectiveness if applied after derma rolling. Disinfect your roller with alcohol before every use. Roll vertically, horizontally and diagonally over your face for no more than two minutes, back and forth 4-5 times. Thoroughly clean the roller with soapy water after use, and rinse in alcohol and let it air dry. Return your roller to its plastic case for storage. Rollers should be sanitized/disinfected BEFORE and AFTER every use for the best results. We include a plastic protector for the roller to keep it clean and free of bumps on the needles when you are not using it in your beauty routine. For personal use only, sharing your derma roller can cause infection. DO NOT share your roller. The potential for skin infection is higher if shared with between two or more individuals. Derma rolling should never be performed on any kind of open wound or skin blemish. It would be counterproductive to say the least to puncture or further inflame existing wounds. It takes several treatments to see results. Your results are based on the accumulation of the collagen and elastin. Therefore, you will need several treatments in order to see desirable results. For people with severe skin conditions, a minimum of 4 to 6 treatments are required. Dermaroller must be disinfected. It is vital to disinfect and clean the roller for each treatment to prevent infection. You can use Hydrogen Peroxide or Isopropyl Alcohol, first rinse your dermaroller in hot soapy water, then disinfect. Do not use on eyelids. Do not use if you are allergic to metal. Keep out of reach of children. Improper usage can cause damage.